Artistic and refreshing, Chevron pattern is what you need to spice up your wedding look. The chevron pattern has that amazing zing to it which really pops out in any outfit and will surely glue all those eyes on you. 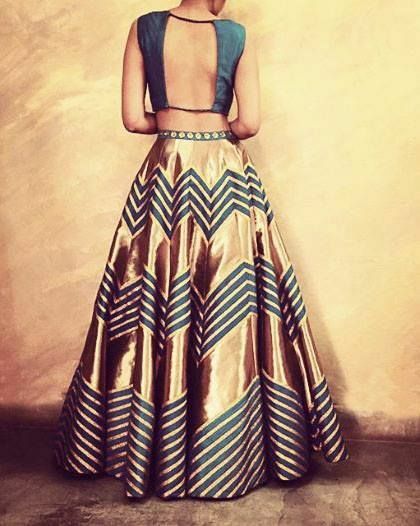 If you are the new age bride who wants to come out of the usual floral and heavy embellished designs of a lehenga and instead opt for something which is light weight, trendy and happening then the Chevron pattern is what you should get! Isn't it just so lovely! The Chevron pattern in a mixed ombre colour makes for a sweet statement. I love how Saniya Mirza has paired this Chevron pattern anarkali keeping the makeup minimal and letting the outfit be the center out attention. The Chevron Print is so eye catchy that you won't have to make any extra effort to stand out. The above Anarkali is perfect for your engagement look, your sangeet/mehendi look and it will even fair well for a day wedding - Just pair it with a heavily embellished peach dupatta and you are good to go! 3. Heavily Embellished Chevron Outfit - Perfect for a night wedding! Bling + Chevron ? Why not!! If you are a person who loves bling and a heavily embellished lehenga i swhat you prefer than you can go for the above outfit. It has the element of bling and the artistic Chevron pattern - Perfect piece for an outstanding Bridal look! 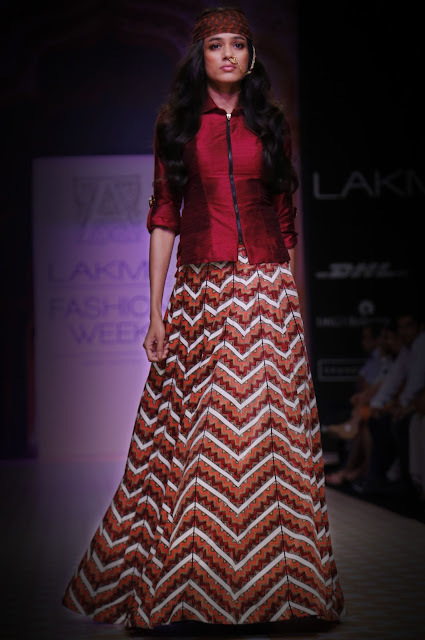 Skirts and lehengas are your best bet when it comes to the Chevron print - you can never go wrong with them! 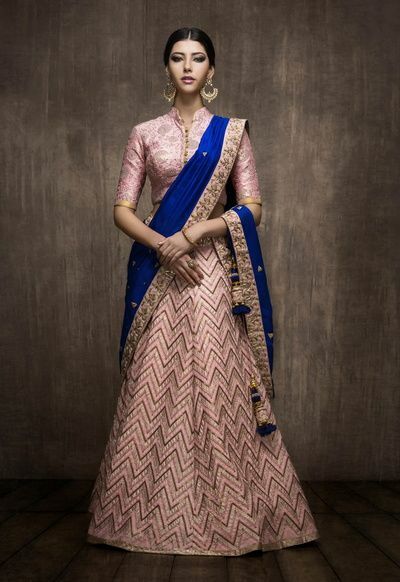 If you love neutrals than you can go for this soft peach pink Chevron pattern lehenga from Kallidorah. You can opt for a more heavy dupatta with embellishments or a one with the famous Bandhani print - Will look amazing! Go heavy on the jewelry and dont forget to wear an interesting head piece like a Jhoomar or a kundan maang mehendi. 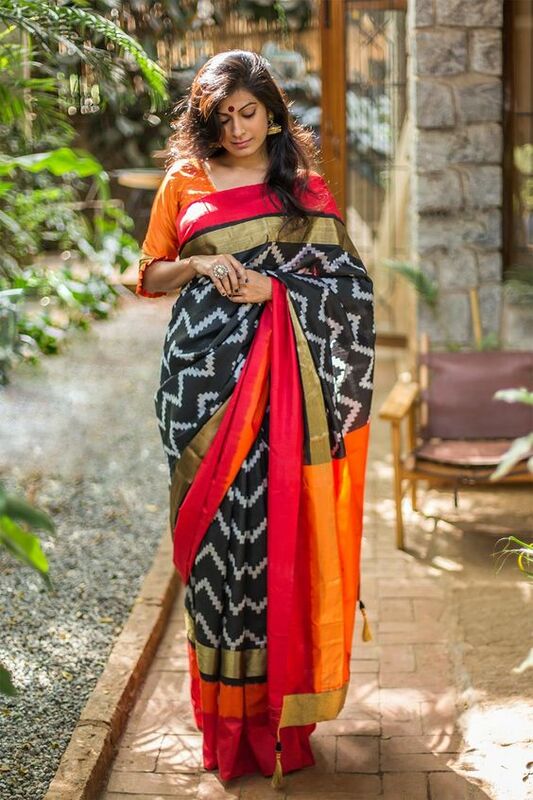 Chevron pattern looks zestful on Sarees too! 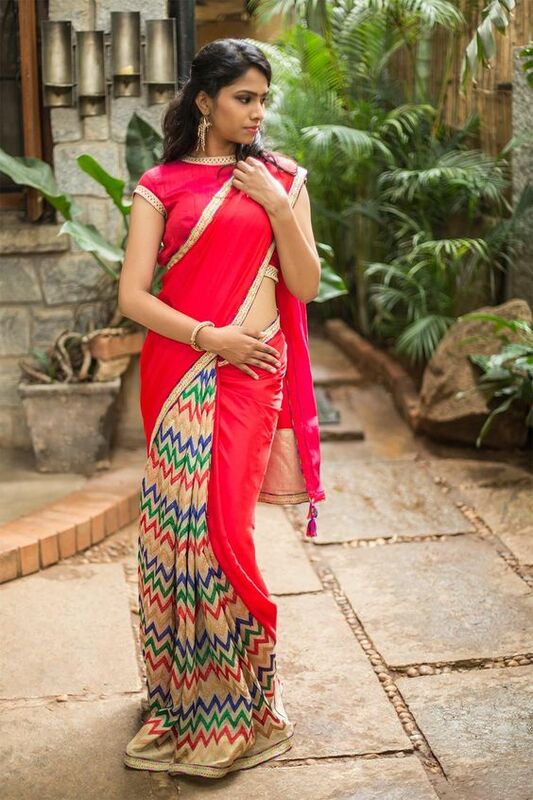 For your day pooja look or an after-the-drama relaxed night look you can opt for this pretty Chevron pattern saree. Look for a colour which compliments your eyes, leave your hair open and don't forget to wear an interesting kamarband! Who says you cannot look full on ethnic with the Chevron Pattern? The above pic is the perfect example of the Indo-western blend. 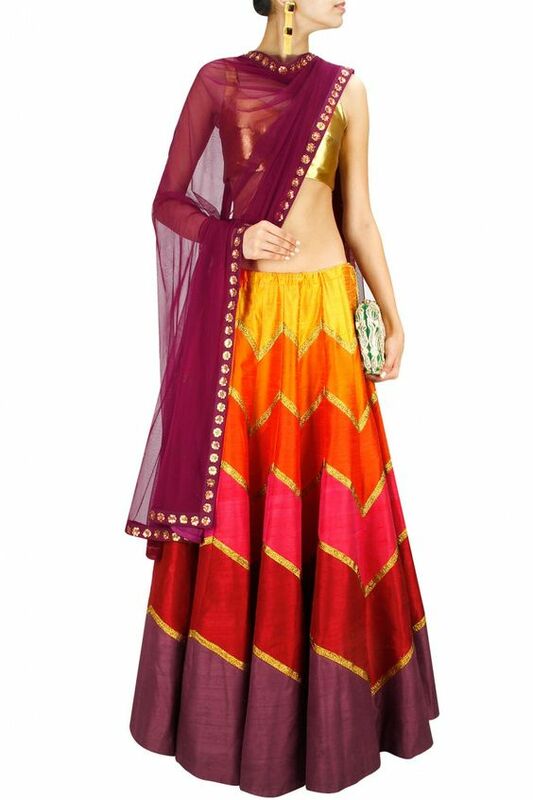 Pair your lehenga with a interesting cut out blouse to add that extra edge to your outfit. 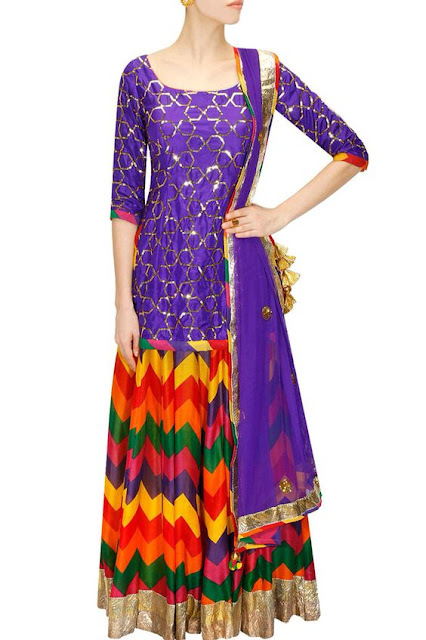 The above Chevron Anarkali is perfect for your Mehendi look. Pair it with an interesting lime yellow dupatta with pink motifs. Pernia's Pop Up has a very impressive collection when it comes to the Chevron Pattern! 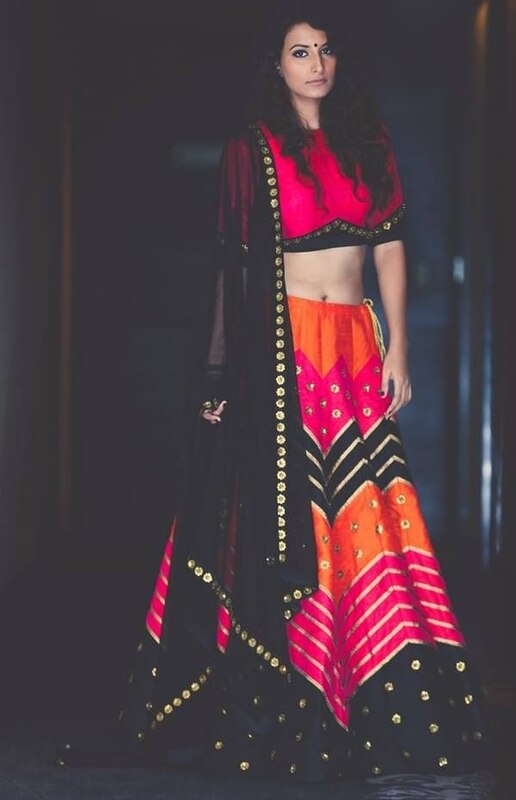 I am totally in love with this multi coloured lehenga which is appropriate for any occasion be it the Mehendi, Sangeet, engagement or even wedding, if you can wear it right! Chevron Pattern with different coloured strips looks beautiful! 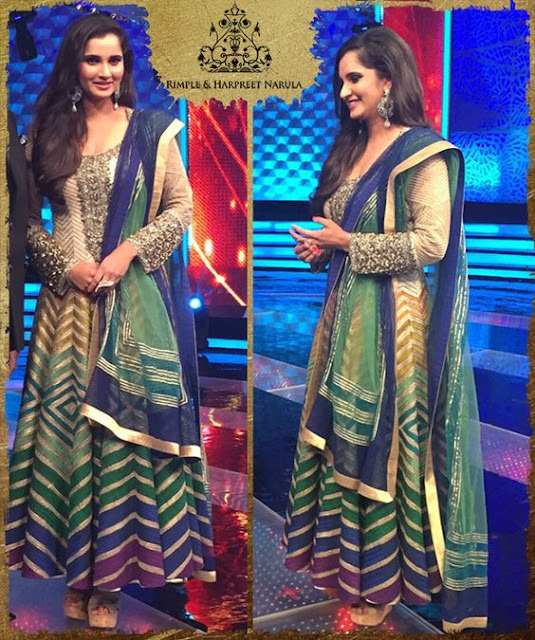 Pair it with a gold colour blouse and a vine dupatta and you are good to go! Polka print paired with the Chevron pattern makes for a stunning outfit which will make your day memorable. The pops of colour with the black stripes and polkas makes this outfit a must have for every bride to be! Chevron pattern has been raging on the ramp too. You can pair it with a jacket blouse to add that extra edge. 12. Pink and Peach Super Cute Chevron Lehenga - A sure shot head turner! I personally love the above outfit the most as it has that baby pink shade I LOVE with bridal bling and a very soft Chevron print paired with a peach dupatta and embellished blouse - WOW! If you do not want just a little bit of chevron print here and there, you can look for a saree like the above one that incorporates the chevron pattern in either the Pallu or the skirt portion. 14. 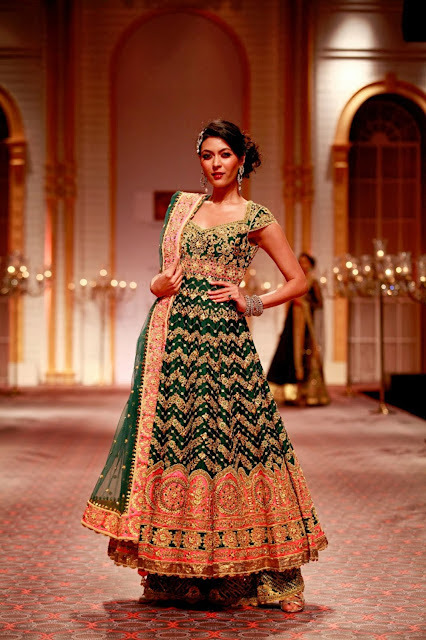 Chevron Pattern Ghagra Choli - The ultimate mehendi outfit! 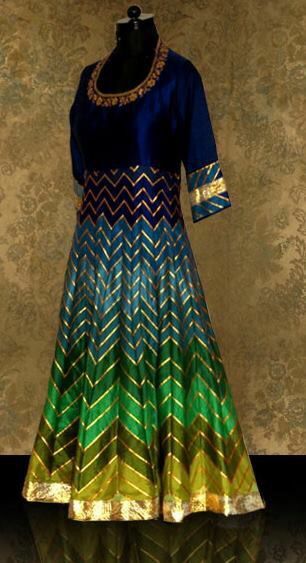 Your mehendi outfit is incomplete without zaps of colour and colour paired with Chevron will simply make irresistible! Pair this outfit with Mojri Jutis and real flower hathphools for a fresh look! Which of these chic Chevron pattern outfits do you love? Do let us know in the comments below!